This project was very time consuming, but well worth the effort when it was done. As a furniture flipper, I come across alot of high gloss dining tables for sale because most people are scared to take on that “high gloss” finish when doing a painting project. Thank goodness I have a secret weapon…..Dixie Belle’s Slick Stick. 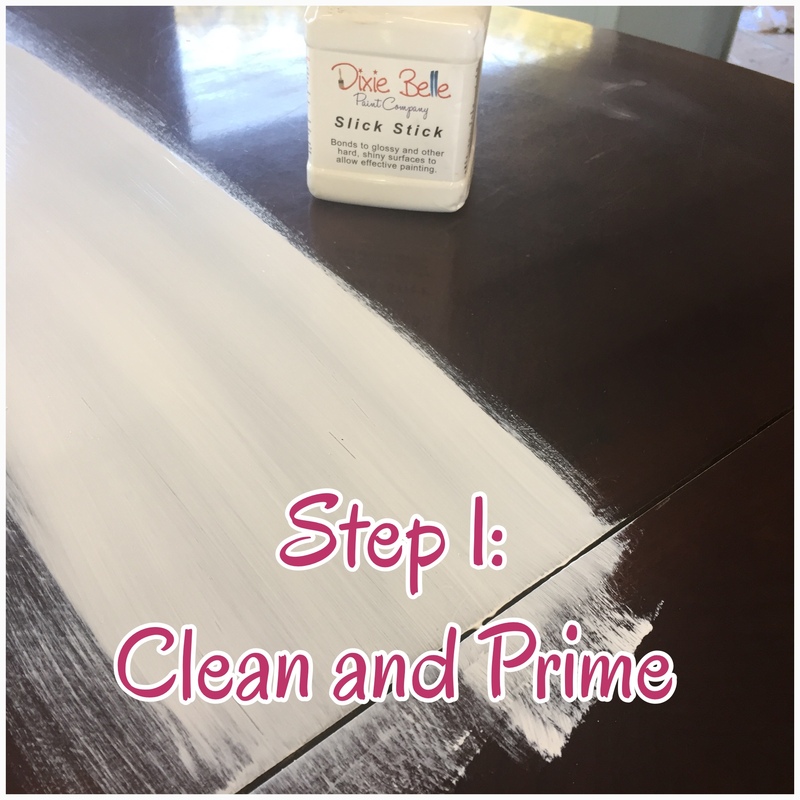 Slick Stick makes any glossy surface paintable without sanding ( even glass, epoxy and metal). The only prep involved before applying Slick Stick is making sure your piece is cleaned REALLY well. 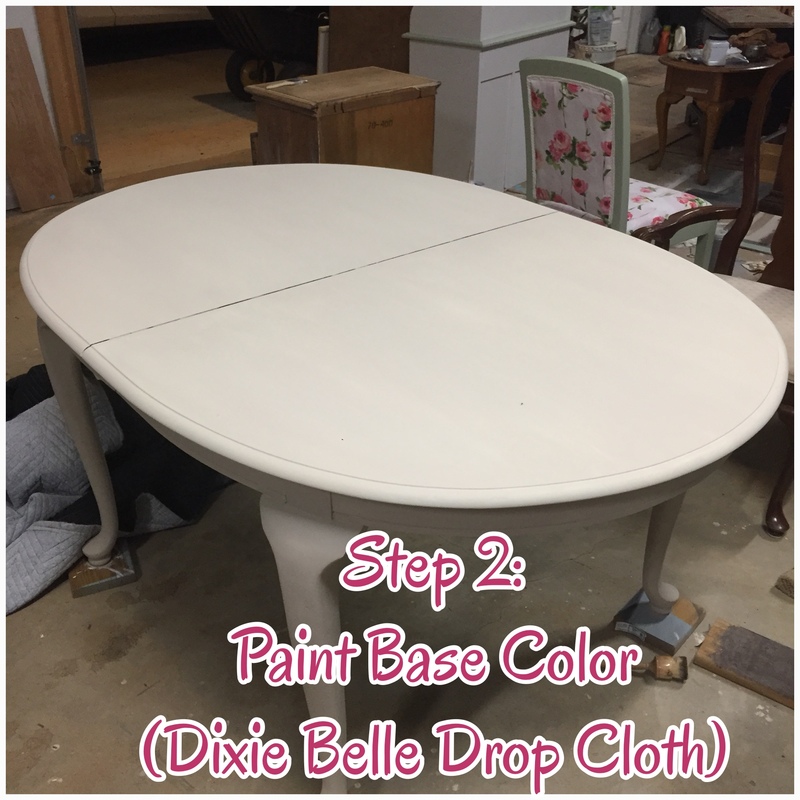 The next step is the paint a base coat your piece with a natural tone such as Dixie Belle’s Drop Cloth (like I did) or their Sandbar. I wait an hour then come back and put on a second coat giving the piece a really good coverage to hide the Slick Stick primer. 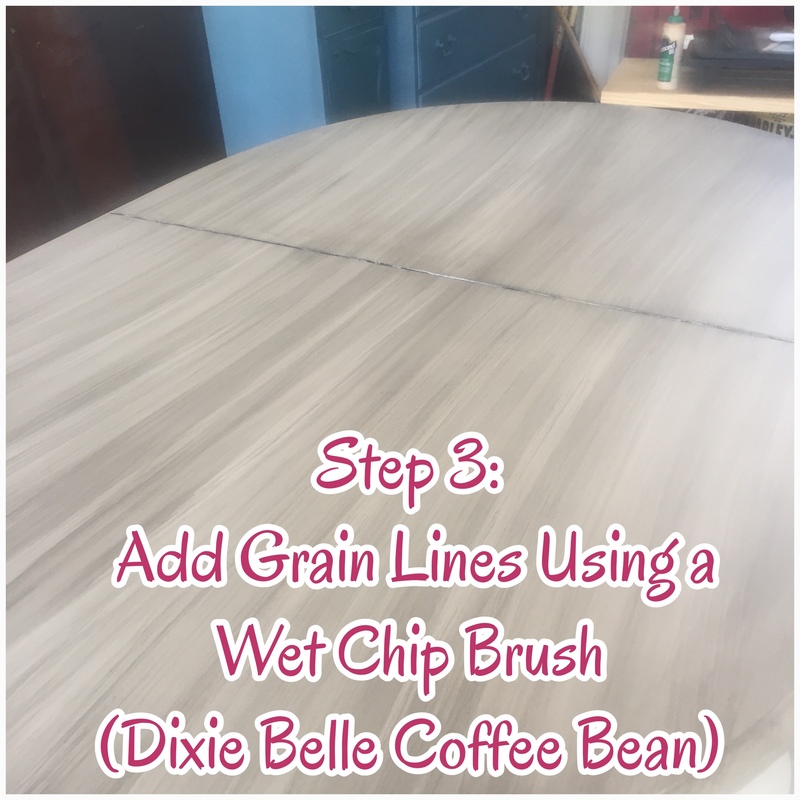 With a damp chip brush, I apply a dark brown (I used Dixie Belle’s new color Coffee Bean, which will be available in July 2018) to give grain like streaks over the Drop Cloth. This is the same as dry brushing (using very little paint on the brush tips) but I’m using a damp brush and not a dry one. 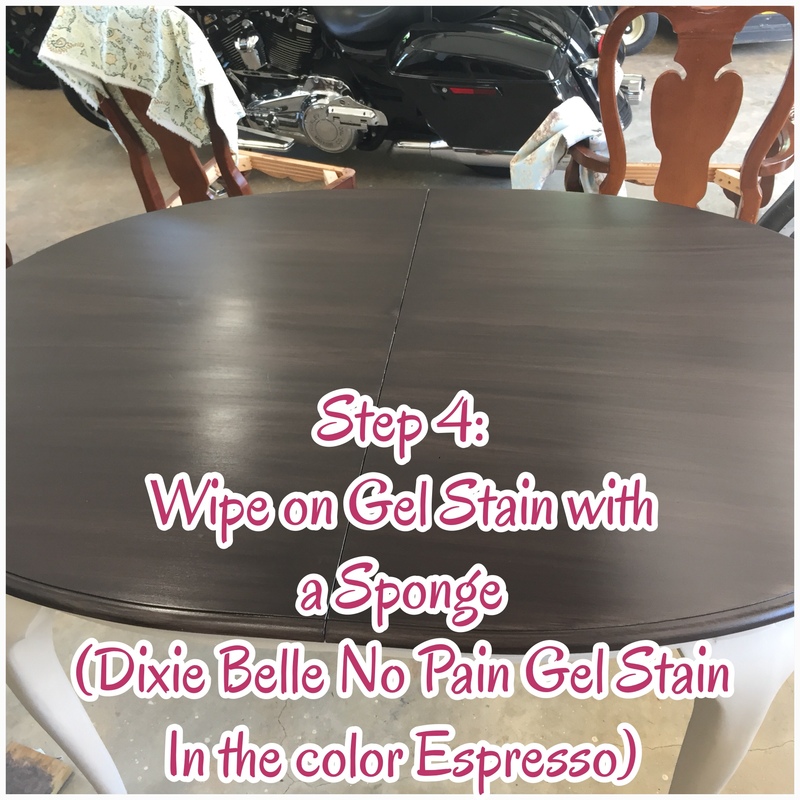 Then comes the fun part….. using a sponge, I apply Dixie Belle’s No Pain Gel Stain in the color Espresso in long even streaks from end to end (do not stop..go from one end to the other to avoid “stop” and “start” marks on the table top). I only do one coat of the gel stain so that it is thin enough to show the dark brown streaks and the Drop Cloth underneath. After applying the gel stain you need to wait 3 days before sealing this with Gator Hide or Top Coat. 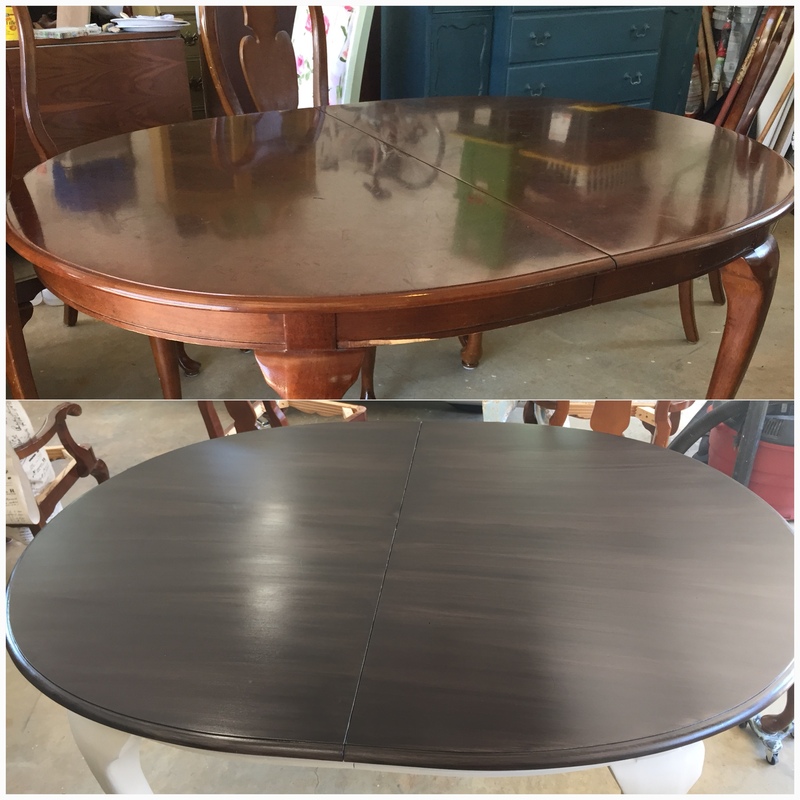 Check out the difference….It really gave an updated look to this table. I added clear wax followed up with dark wax in all the details of the legs and chairs to give it an aged look. Then all that was needed was to recover the seats with an updated fabric and it was all done. Now it’s your turn ….. what are you waiting for ? 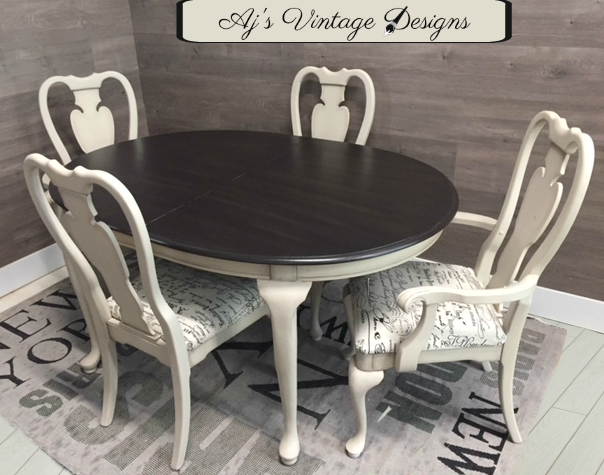 Update that old dining set to give it a fresh new look.